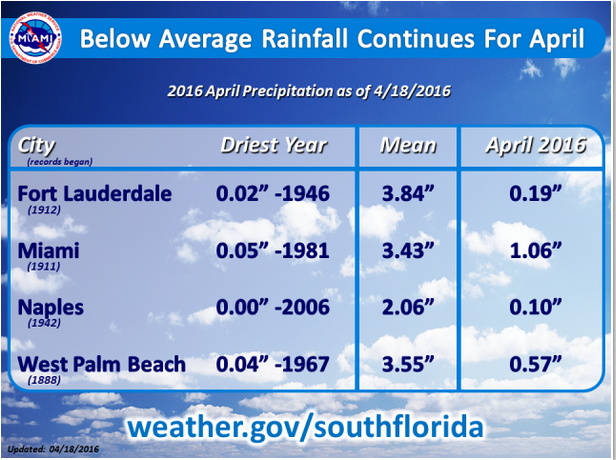 Lack of rainfall in Coral Springs and the surrounding areas have seen record lows these past few months. It is best to water during the early morning hours. The temperatures are cooler and there is less evaporation loss. By watering in the morning the grass is already wet from the morning dew and you will not alter the natural state of the grass. If you forget to set your timer for the morning time, you can water late in the afternoon. It is important to chose a time before dark to allow the grass to dry. Watering at night is not recommended because water left on the blades of grass can encourage fungus and disease. 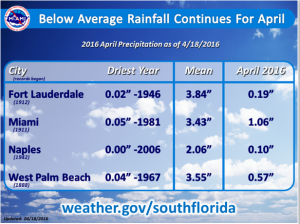 Most Florida soils require an average of 1/2 to 3/4 of an inch of water per application. This should be plenty to replenish the grass. Your goal is to saturate the root zone and then let the soil dry to encourage healthy, deep root growth. During the summer months and months that lack rainfall it is recommended that you try to achieve 1 full inch of water per watering session. So how do you know how much water your lawn is actually getting? Here is a neat trick to determine how long to run your sprinklers. Place several empty, straight-sided cans or cups at different locations and distances within one zone. Then run the sprinklers for 15 minutes and measure the amount of water that you have collected in each. You can then calculate an average water depth and determine how long it would take to apply 1/2″ , 3/4″ or an inch of water. Do this can/cup test during warm weather if you are seeing particular areas of brown crunchy dead patches to learn if your sprinkler system is or is not reaching the affected area. Then you can determine if the brown crunchy dead patches are getting some water but maybe not enough to keep it healthy. « How to choose the proper grass for your lawn.